If you are looking for a safe and reliable source of cleaning services in emergency then Maid Service-NYC is the ideal destination for you. We specialize in providing maid services for almost all occasions and circumstances which includes emergency cleaning services in the list. Be it the sudden arrival of your parents, relatives or friends who were due in some period of time but you are now expecting them anytime soon or just a surprise visit from your boss, Maid Service-NYC is your 911 in such times of urgent cleaning. 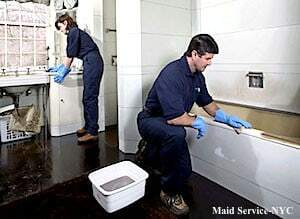 We respond immediately to calls and orders for cleaning. We have a whole team of dedicated workers, working tirelessly at all hours and providing immaculate services to the customers. We guarantee prompt response to calls for special situations. Our managers will correspond with you and talk to you regarding the services so that the maids reach your place as soon as possible. Even in emergency situations now you can sit back and relax on your couch while our maids take the charge of spotlessly shinning your house or apartment for you. Our team comes fully equipped with all the necessary products and supplies to combat every germ and dirty spot at your place. In just a matter of time they will clean every nook and corner and leave the place spick and span. Even in emergency our teams will leave your bathrooms sinks, tubs and showers shinning and spotless. The kitchen is scrubbed, scoured and oven tops are released of grease and oil marks. A quick cleanup of the whole place including ceiling, walls and floors. Removal of unwanted odors and smells. The cleaning is up to the mark and as per your desires. Emergency cleaning is a privilege cleaning service offered by us. It takes worry off the shoulders of our customers and leaves them stress free in a clean and welcoming house which is comfortable and gives a feeling of relaxation.